As the major players from around the world participate in the graphics cards race to make consumer-ready 7-nanometer GPUs, AMD has taken a significant lead by officially launching the world’s first chip featuring the technology. The catch is that these cards – the AMD Radeon Instinct MI60 and MI50 – are specially designed for data centers and won’t be hitting the mainstream gaming market. 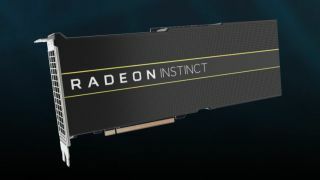 More specifically, AMD claims that the two new Instinct GPUs are “designed to deliver the compute performance required for next-generation deep learning, HPC, cloud computing and rendering applications”. The flagship MI60 model is capable of 7.4 teraflops when working on 64-bit floating point data and has 32GB HBM2 memory with a bandwidth of up to 1Tbps. Using the company’s Infinity Fabric tech, you can link up to 4 MI60 GPUs into a hive, and then link two of these hives to form a single server capable of speeds up to six times that of PCIe 3.0. While this is all excellent news for those that work in AI and other high-performance computing, where does it leave the gamers? The high-density, high-efficiency 7nm technology might not have come to gaming cards just yet, but AMD recently promised to announce its 7nm graphics cards at CES 2019, along with processors that use the same dense architecture. Based on the company’s roadmap, this will include Ryzen and Ryzen Threadripper third-gen CPUs with the 7nm Zen 2 architecture as well as AMD’s line of GPUs – the Vega series – getting the 7-nanometer treatment. While Nvidia has made waves with its recent RTX 20-series, including the beastly GeForce RTX 2080 Ti, we’re yet to hear anything solid regarding its work with the 7nm architecture.